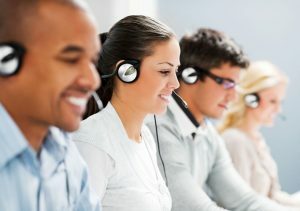 Uniquely, our call recording solution is cloud-based and delivered “as a service,” so you get enterprise-grade platform that’s highly reliable, scalable, secure and available immediately on a subscription basis. No Equipment to Buy – Leverage our enterprise-class call recording platform, located in our secure data center, with no need to add any hardware on site. Pay as You Go – There’s no upfront capital investment required, you pay for the call recording services you need as a monthly subscription. Scale Easily – Our cloud-based system can quickly and easily scale to thousands of users across distributed locations. Offload Management – There’s no need for you to administer and manage the call recording system; our expert engineers do it for you 24/7/365. Ensure Privacy – We offer multilevel access control and partition multitenant resources to ensure data protection and customer privacy. Support Virtual Workers – Because our platform is in the cloud, it’s accessible to remote and mobile workers who have an Internet connection. Our call recording solution is flexible and is integrated with our cloud-based unified communications solution. Plus, you can seamlessly integrate our call recording solution with third-party applications, such as CRM and help desk systems, to achieve superior customer service and maximum business results. Web-based User Interface – Access your call recordings anytime, anywhere with our intuitive, user-friendly web interface. No desktop software required. Intuitive Call Search & Playback – Quickly and easily search millions of calls by any parameter, such as date, time, caller/callee number, number or agent’s name. Or simply type in a search term. Playback is available from your browser window. Multiple Recording Options – Record all calls automatically, select calls to be recorded based on rules or specific criteria, or initiate call recording on-demand from your web browser or IP phone. Look Back Technology – Recover conversations from the beginning – even for calls already in progress. With our Look Back feature, you won’t miss a single word. Centralized Multisite Call Recording – Record calls made to and from multiple locations or branches. Real-time Dashboard – Gain a real-time picture of your performance with our dashboard showing calls per day, call duration, active calls, total number of recorded calls and more. Reporting – Generate statistics for calls, day, users, employees’ performance and more with our comprehensive reporting features. Live Monitoring – Monitor employee’s calls in real time to guide and support agents in delivering deliver optimum customer service. Customizable Score Cards – Evaluate employees or call center agents using built-in score cards or quickly customize existing evaluation forms with this optional, add-on feature. Customizable Access Privileges – Define user roles and access to functions, such as playback, live monitoring or administration. File Watermarking – Validate the authenticity of any .wav audio file with our application. Audit Log – Monitor sensitive information to ensure maximum security and regulatory compliance. Pause & Resume Recording Triggers – Automatically pause and resume the call recording process to omit sensitive data, such as cardholder information with this optional, add-on feature. Encryption & Advanced Security – Ensure the highest security with 256-bit AES file encryption and access to call recording via SSL/HTTPS connections with this optional, add-on feature.